BabyX is not a real baby. 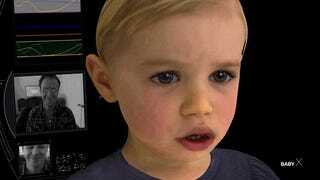 It is a simulation of a baby — one that learns, reads facial expressions and gets bored. It is also frightening to behold. In the video above, BabyX's shows off its ever-growing vocabulary. 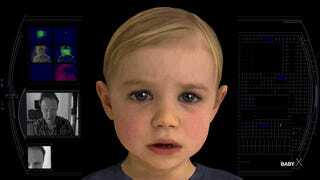 She was created by the folks at the Laboratory for Animate Technologies at the University of Auckland, who will no doubt be seen as traitors to humanity when the Great AI Baby Judgement Day happens. Look at her — Learning our games, toying with our emotions. 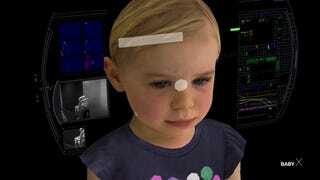 First she'll master Pong, then she'll be an expert at DotA. Then what? The end of the world, that's what. Seriously though — very impressive work. 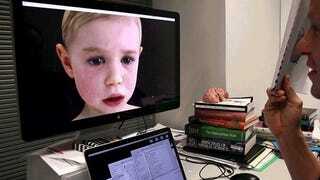 You can read more about this psychobiological simulation over at their site.